We are delighted to announce the next deVine Club Wine Dinner due to take place on Friday, June 27, 2014! Our wine dinners have begun since 2001 and have been a great success comprising a sumptuous 5-course menu paired with premium wines specially selected to complement each dish! 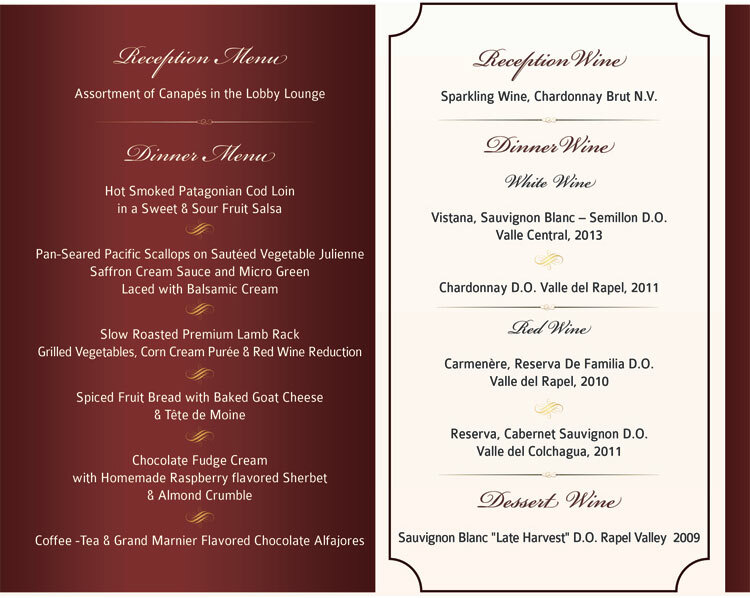 Wine enthusiasts will have this opportunity to partake in the quality and excellence of Santa Carolina Wines while sipping, savoring and indulging in another gastronomic feast prepared by our culinary team. Our upcoming wine dinner, "Santa Carolina: Worldwide Recognition of Excellence" will feature delectable food and wine pairings that will surely delight every palate with its overture of succulent textures and tantalizing flavors. Wine lovers will have the opportunity to partake in excellent Chilean Cuisine along with the vibrant essence of Santa Carolina wines. The evening will commence with a cocktail reception at The Bar of the Royal Cliff Beach Hotel at 18:30 hrs and dinner will be served at the Royal Grill Room & Wine Cellar at 19:15 hrs. 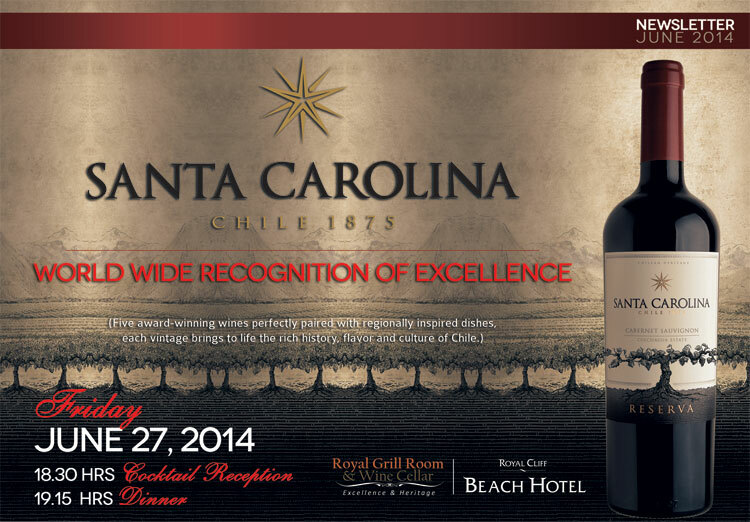 Santa Carolina is the main brand of Carolina wine brands founded in 1875 by Don Luis Pereyra Cotapos. Today, more than a century later, it stands out as one of the largest and best known wineries in Chile with its wines present in more than 80 countries all over the world. Santa Carolina's philosophy and main motivation lies in making and producing wines that showcase Chile and its people while at the same time creating happiness and satisfaction for both its local and international consumers. Their wines reflect personality and complexity together with consistency and quality making them easy to drink and enjoy. Recognized internationally since 1889 with a gold medal in Paris, Santa Carolina is in a constant search of new varietals and terroirs in its purpose of continually surprising its customers worldwide. 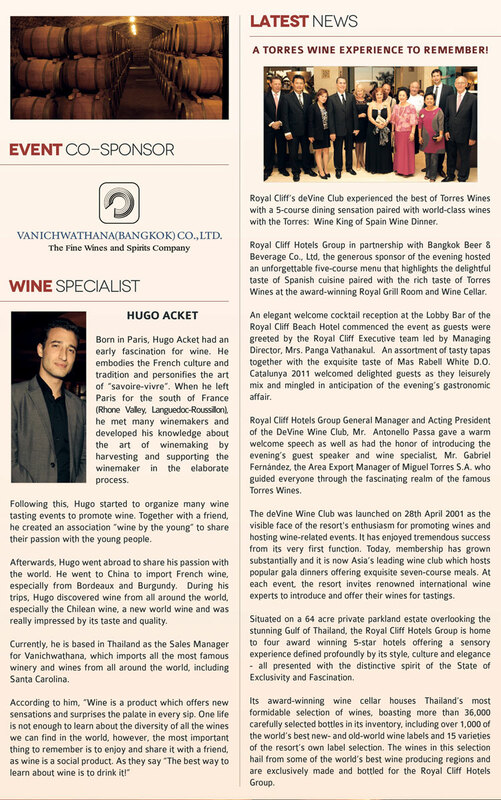 Mr. Hugo Acket, the Sales Manager for Vanichwathana, which imports all the most famous winery and wines from all around the world, including Santa Carolina, will be our wine specialist for the evening. Born in Paris, he has met many winemakers and has developed knowledge in the art of winemaking as he travels abroad to share his passion for wine with the world. Once again, we are pleased to host this treasured culinary event for wine lovers which provides the great opportunity to all our valued members to experience the quality and richness of the famous Santa Carolina Wines.